Hi! I am preparing for tonight’s Birthday Bash class and could use some input. Which card would you prefer to make if you were attending the class? For both cards I sponged Old Olive, Crumb Cake and Soft Sky before stamping the image in Early Espresso. 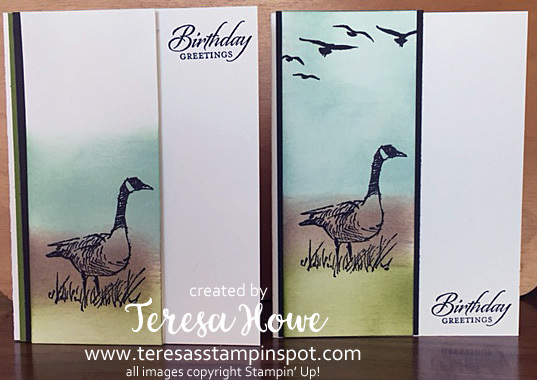 I added the flying birds from High Tide to the card on the right. The sentiment is also stamped in Early Espresso. And don’t forget, if you shop my on-line store here and use hostess code: P7BEBFAP you will also receive a FREE embellishment from me. Orders must be placed by Midnight EST Sunday, Feb 5. Thanks for helping me out and for stopping by! I like the one with the extra birds! Both cards are beautiful! However, I prefer the card on the right. Something about the birds in the air and the greeting on the bottom that truly caught my eye! The color combination is great and so masculine. I think both are great, but I like how you carried the blue sky all the way up on the right card and added the birds in flight too. Love the birds! Makes the card more balanced and beautiful to my eye. Love both cards! I would choose the one with the birds. Congrats on 12 years!!!! Celebrate!!!! Of the two cards, I think I like the one with the birds the best. Congratulations on your anniversary! I love both cards, but agree with everyone else that I really like the one on the right best – it’s just gorgeous with the extra birds! I love both cards, but I prefer the right one with the birds. Beautiful cards for a masculine birthday. I love the one with the extra birds , I really like the way you colored all the way up ! I prefer the card with the blue sky and flying birds. The one with the birds, in part because I prefer the way you carried the blue all the way to the top.